This is one of the most peaceful cafes I have ever been to. I've been going to the cafe at Toplou Monastery since I first spent time in the Sitia area for an excavation in 2003. I've taken every guest who's come to see me in Crete up there. And I've gone there with Sage many times (together with her friend Mayia once). Why do I love it so much? I think it has to do with the very hushed, respectful atmosphere, due to the monastery next door. It is also wonderfully shady, from vines growing overhead, complete with hanging bunches of grapes in late summer. 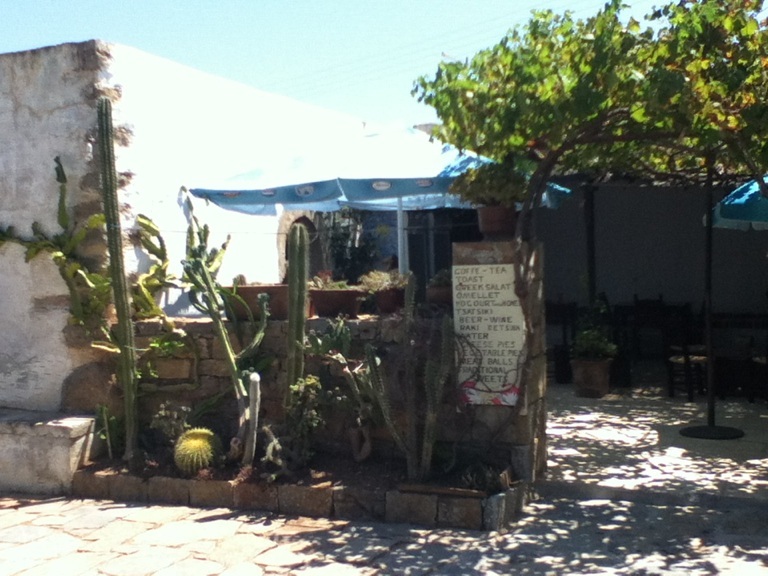 All around the Monastery are pots full of gigantic cacti and succulent plants. The area of Toplou is extremely arid, it's perched on top of an almost totally barren hill. So there is something about the shady, peaceful cafe that gives the impression of an oasis. They have a fairly limited menu; it's a kind of salad, omelette, chips type of place - great for lunch after a swim at one of the small beaches close to Itanos or Vai. I have often been there just for a slow coffee with a newspaper. I would definitely recommend that you ask politely whether your dog can sit (on his/her lead) at your side. I have never had any problems however, even with two dogs. If you want to see inside the Monastery, and it is well worth it for the Byzantine icons, documents and engravings that they have on display, you would have to leave your dog with a friend and take turns. There is no shade at all to leave your dog anywhere outside. While you're there, take the time to look at the small shop selling hand woven rugs, throws, and garments! The woman working there has a loom inside the shop, and may give demonstrations if you ask.